Scotty Nguyen is a five-time WSOP bracelet winning professional poker player who was born in Nha Trang, Vietnam, on October 28, 1960. In 1974 he fled Vietnam for the United States, and is one of the best Vietnamese-American poker players today. Scotty Nguyen had trouble adjusting to life in the United States, but found that he enjoyed playing poker games. He was eventually expelled from school because he spent too much time playing poker and not enough time on his studies. Scotty Nguyen went to the poker tables in southern California and lost his bankroll. This led Scotty to become a poker dealer, where he learned more about the game and managed to become a successful poker player. Scotty won his first bracelet in the 1997 World Series of Poker, where he won the $2000 Omaha 8 or Better event. 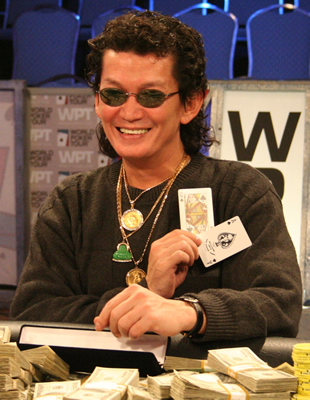 The following year, Scotty Nguyen won the 1998 World Series of Poker Main Event, defeating Kevin McBride with the memorable phrase, “You call, gonna be all over baby!” There was a full house on the board and Kevin called, but Scotty Nguyen had a better full house to become the champion. Scotty won two bracelets in the 2001 WSOP, the first in $2500 Pot Limit Omaha, the second in $5000 Omaha Hi-Lo Split Eight or Better. Scotty Nguyen had also made more than a half dozen World Poker Tour final tables before he won his first WPT title in January 2006 at the Gold Strike World Poker Open when he defeated Michael Mizrachi on the first hand of heads-up play. In 2008, Scotty Nguyen went on to win the prestigious $50,000 HORSE Poker event at the World Series of Poker. The behavior of Scotty Nguyen was brought into question by many after winning the event. At the final table, Scotty Nguyen was drinking heavily, asking the waitress for more and more beer, getting upset and belligerent when they wouldn’t bring his beer fast enough. He taunted the other players, Erik Lindgren and Michael de Michelle, until finally winning the event. This win also made Scotty Nguyen the only player to have won both the WSOP $10,000 Main Event and the WSOP $50,000 HORSE event. Scotty Nguyen currently lives in Henderson, Nevada which is very close to Las Vegas.